The video footage was recently taken at two separate locations and clearly demonstrates how attractive our little fury friends find roof voids and loft spaces particularly if they are well insulated providing perfect nesting material. The customer at one of the locations was alerted to their presents when he heard the little darlings walking across the ceiling and was convinced that they were wearing hob nail boots! Needless to say that picking this particular loft space turned out to be very bad for their health so we thought it only fair to take a leaf out of the department of health’s book and issue the following warning to all rodents. Call us now if you have a rodent problem in your business on 01630 652 958. I am an experienced Pest Control Officer with well developed skills in the control of mammals, insects and birds. 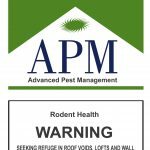 I have had the experience of running my own pest control business before joining Advanced Pest Management on 7th April 2015. I strive to deliver a highly professional service taking into consideration the individual needs of every customer. I am an enthusiastic, honest, and a reliable member of the team, respecting the confidential needs of the customer and apply empathy and understanding to all situations. I endeavour to constantly improve my skills and experience by regularly attending training courses keeping up to date with the latest legislation and technology within the industry.